, Shawn Anchor tells a most interesting story of ‘the African Unicorn’. British traders in the 19th century had found ancient Egyptian carvings and writings of this half-zebra, half-giraffe. They declared it to be a mythical creature as it was a biological impossibility. However, people from the Congo basin insisted that they had seen such an animal in the deep forests. Western biologists found this laughable and put it down to the ignorance and superstition of the ‘natives’. When Sir Harry Johnston in 1901, an interprid explorer, came upon some pygmy natives caputred by a German explorer. He intervened on behalf of the pymies and paid for their freedom. In gratitude, the pygmies gave him pelts and skulls of the ‘unicorn’. However, the scientific community scoffed at Sir Johnston even when he insisted that he had seen the tracks of these animals. But in 1918, a live Okapi was captured in the wild. And a decade later, the first okapi – a cross between a giraffe and a zebra – was successfully mated in Antwerp. These days, the ‘mythical’ creature is quite a common sight in zoos around the world. Isn’t this beautiful creature such a brilliant example of a paradigm shift? Earlier this week, I had a paradigm shift. Our neighbour’s driver is always hanging around our colony trying to find people to chat up with. Times without number I’ve seen his employer having to go looking for him. And the couple of times, I’ve interacted with him, I’ve found his behaviour a little odd. I grumbled about him although he had nothing to do with my life. Then on Monday, our maid told me that this guy had spoken to her the day before, telling her that he hadn’t come to work the previous day because it was his daughter’s 15th birthday. Six months earlier, she had a fall while playing in school and died instantly! When my maid told me this, I was so humbled. I completely understood his reason to talk incessantly. It’s his way of coping. Change. That’s what a paradigm shift involves. Looking at something with new eyes. 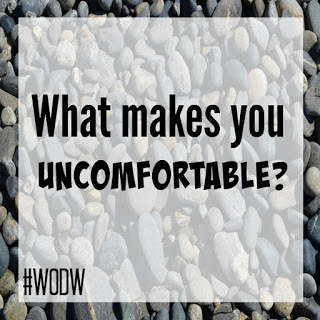 Allowing ourselves to be uncomfortable. Because change means stepping outside our comfort zones and seeing things from a whole new perspective. I’m linking into The One Word Linkup is hosted by Lisa of The Golden Spoons, Janine of Confessions of a Mommyholic, and Marcia of Blogitudes. This week’s prompt choices are: Small / Change. What a fabulous post! That is definitely a wonderful view of things, and learning all the time. Have an amazing week! There was a person I knew casually whose behavior changed, quite suddenly, for the worse. It turns out she was a caregiver for her mother and was under a lot of stress. Sometimes, we don’t give people a chance. We just don’t know what is happening in their lives. I’ve been accused of being in favor of change for change’s sake, and I’m not sure that it isn’t too far from the truth, lol. I’ve had so many wonderful experiences, simply because of change. Change of view, change of route, change of taste, change of choice, change of adventure, and more. Thanks for sharing Corinne. Humans can be complex yet we all have a story and behavior can hide our pain. Beautiful stories to share, both share wisdom! Thank you for sharing these two stories! It is a good reminder that anything is possible AND though people’s behavior might trigger something uncomfortable inside of you, it might be there to teach you something about life. Two amazing stories! I heard a quote once that I cannot remember exactly, but it basically said we shouldn’t judge others because we never know what struggles they may be going through behind closed doors. It is a quote I have always remembered, but I definitely find it hard to put into practice sometimes. That poor man. I adore your attitude. And once again, it kind of parallels a mental shift I had today. Last night I discovered that a neighbor girl stole a trio of miniature ceramic koi, probably thinking I’d forgotten about them as they were underneath something else in my fairy garden. Disappointed and annoyed, I got to thinking how I live in a peaceful neighborhood and that, quite frankly, nobody in my vicinity is actively trying to destroy me. It improved my attitude to look at how truly bad life is for so many folks. On another note, I did a few dumb and rather heartless things as a child, too. I’m definitely NOT going to start a neighborhood feud. Best wishes! And thanks for making me smile over the lovely okapi image.